You see a map that contains territory of Kazakhstan. town Moyynkum presented. town Ulken marked. town Aqbaqay download for free. Displayed town Khantau download for free. Displayed town Mynaral presented. On this map Zhabaykezek presented. On this map Yerikty download for free. Yenbekshi marked. Uzekh marked. You can find here Sortums download for free. Somsonovka free download. You can find here Shyghanaq marked. You can find here Shimpek free download. Sharua download for free. Semiz-Kul' download for free. 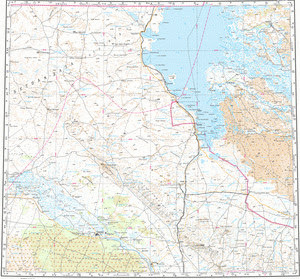 On this map Sarykomey for Garmin. Pos'yet presented.